Snow and ice accumulation can become incredibly heavy and put a great deal of stress on your roof. With enough weight and an added dose of high winter winds, your building can become vulnerable to collapse. To avoid snowfall issues with your roof, it is important to plan ahead and design according to your situational needs and snow load building codes. A design load that is surpassed by actual snow load can become problematic and cause a roof collapse. Luckily, steel structures already have an advantage over traditional wood buildings due to their superior structural durability and integrity. But we’re going to help you make sure your steel building is optimized to get you through winter no matter where you are. You may not know that there are actually several different types of snow. This is important because snow load doesn’t typically accumulate from a single storm, but from a variety of snow events over a period of time. Snowflakes are the most commonly recognizable form of snowfall, comprised of single ice crystals that fall from clouds. When several of those individual crystals combine into a single snowflake, the snow is called polycrystal. There is also hoarfrost, a formation of interlocked ice crystals that form on exposed surfaces when the temperature of those surfaces are lower than the frost point (temperature that allows water vapor to skip the liquid state and immediately form ice) of the surrounding air. Graupel, often called snow pellets and often mistaken as hail, is a snow whose flakes are rounded as the ice crystals fall through liquid cloud droplets and bind with them. These variations in snowfall inherently differ in how they affect a roof, from how they accumulate on the surface to the amount of weight they add. On average, a foot of light, dry snow, typical in western states, can weigh 3 pounds per square foot while wet, heavy snow, typical on the east coast can weigh more than 20 pounds per square foot. A base of ice beneath can weigh more than 57 pounds per square foot. Roof snow load calculations are an important step in planning a steel structure. The value is calculated using a combination of factors including ground snow load, wind exposure, roof shape, slope, likelihood of drifting or sliding snow and other factors like potential building occupancy and structural importance. Ground snow load, from the formula mentioned above, refers simply to the recorded weight of snow on the ground in a given area. The data is compiled by the National Weather Service, and represented as a total with only a 2% chance of being reached and/or exceeded in a given year. These estimates serve as the basis for engineers designing roofs for different regional circumstances. A roof overloaded with snowfall exceeding it limit can collapse causing damage to the building and its contents and potentially placing anyone who may be inside in danger. Signs of load stress that may indicate a critical failure in the integrity of a structure include creaking and popping sounds that indicate excess strain, sagging roof sections, roof leaks, deflecting wall members and misaligned doors and windows that suddenly become difficult to open or close. The best way to avoid these problems is to plan your structure accordingly with a roof pitch fit for your environment. Roof pitch is a key factor in determining the snow-readiness of your structure. A steep roof pitch will be far less likely than a flat roof to allow snow and ice to accumulate. While steep pitches are best, a shallower pitch of 1:12 can be cheaply engineered to suit most needs. It is best to consult with our experts to determine the ideal pitch for your region and purposes. Additionally, you can use several tools to help beat snow load. A roof rake and its 20′ reach can help you pull snow down from a roof and break up the formation of ice while standing on the ground below. Note that this should only be done as absolutely necessary, as falling snow and ice can be dangerous for the person raking. Snow guards can be permanently attached to a roof to reduce the effects of unbalanced snow loads due to drifts and slides. Drifting snow occurs when wind moves snow from one section of roof to another, for instance, blowing from a higher roof to a lower one. 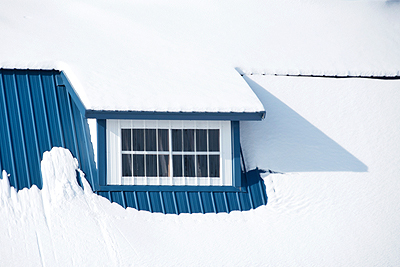 Sliding occurs when snow on higher roof portions becomes unable and falls to lower portions. In both cases, this can lead to very heavy snow in lower roof portions, leaving an uneven, dangerous strain on the roof. Snow guards break up snow before it can slide or drift. De-icers can also be attached permanently and serve to heat the surface of the roof to reduce ice and snow buildup.